As of today, the long awaited version 4.4.0 of the Xfce Desktop Environment is finally available. I will try to highlight some of the new features which have been added since the last stable release. One of the most often requested features during the 4.0 and 4.2 was support for icons on the desktop. 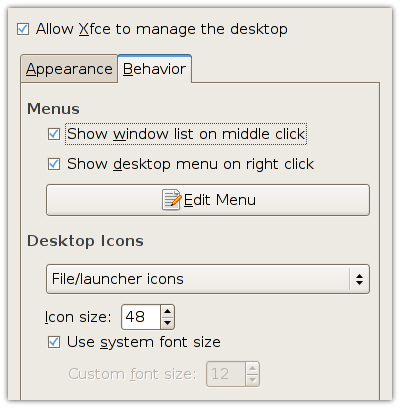 Now, with Xfce 4.4.0, this feature was finally added to the desktop manager Xfdesktop. The desktop manager utilizes Thunar's libraries to handle application launchers and regular files/folders on the desktop. The desktop manager is also able to display icons for minimized windows on the desktop, which is quite a popular feature from the CDE world. Of course, you can disable the desktop icons altogether if you prefer a clean desktop. Xfdesktop also continues to provide access to the applications menu, as it did in the previous Xfce releases. The desktop icon support goes hand in hand with the new file manager Thunar which replaces the previous file manager Xffm. Thunar was written from scratch to provide an easy to use, but still very lightweight file manager for Xfce. 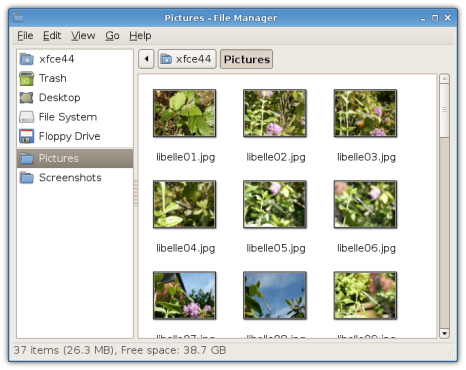 Its user interface was designed to look similar to the file chooser which was introduced with GTK+ 2.4, and other file managers such as Nautilus and pcmanfm already picked up that idea as well. Thunar supports all the file management functionality which users will expect, and also several advanced features. 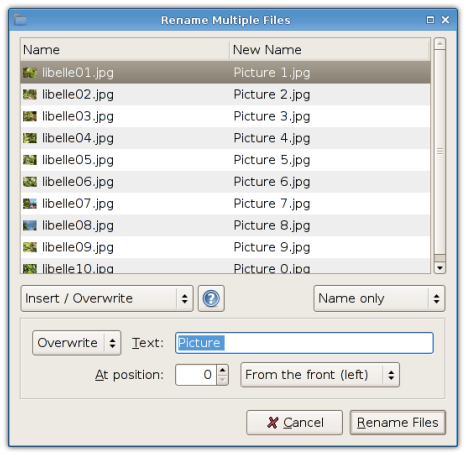 For example, a so-called Bulk Renamer is included which allows users to rename multiple files at once using a certain criterion. 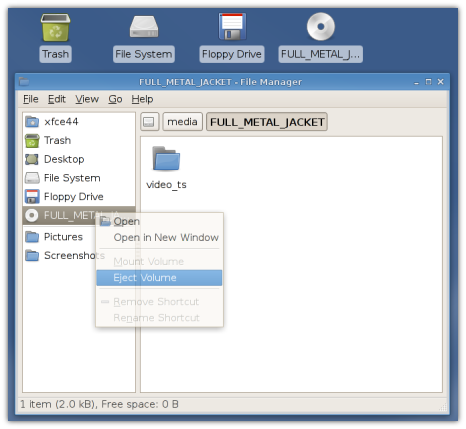 Xfce 4.4.0 provides easy access to data on removable drives and media. Just insert the media into the drive or plug the new drive in to the computer and an icon representing the removable volume will appear on the desktop and in Thunar's side pane. Click on the icon to automatically mount the volume. Right-click the icon to unmount the drive or eject the media from the drive. Note however that this feature requires HAL and is therefore only available for Linux 2.6.x and FreeBSD 6.x and above at the time of this writing (there is limited removable media support for FreeBSD 4.x and 5.x which does not require HAL). The new text editor MousePad is included with this release. 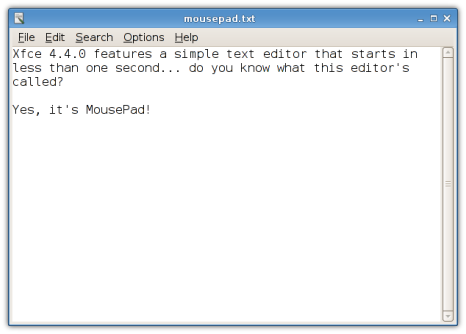 MousePad provides all the basic editor functionality, nothing more, nothing less. You can think of MousePad as the equivalent to NotePad on Windows. It starts up very fast, usually in less than one second, even on older systems. Xfwm4 continues to be the window manager of the hearts. This release features an enhanced compositor, supporting transparent ARGB windows, shadows, window frame transparency and much more. 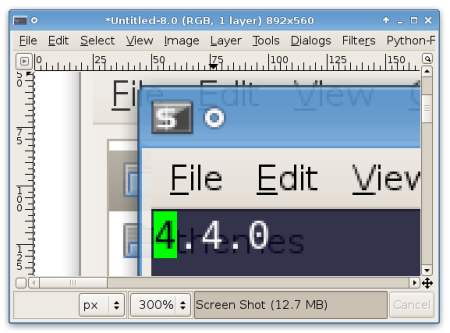 Xfwm4 also includes a brand new application switcher, as shown in the screenshot above, which displays all windows from the current workspace with icons and window titles. Further on support for multiple image formats for window decoration themes was added, including PNG, GIF and SVG images. 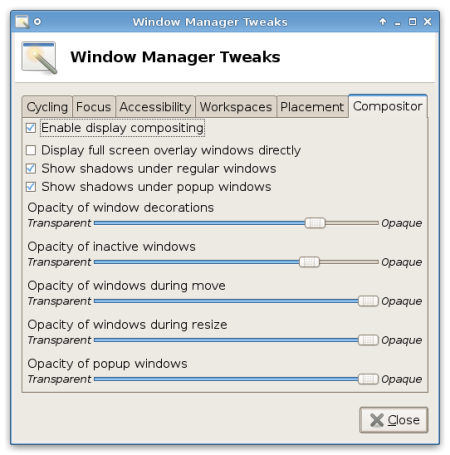 Advanced controls for the window manager were also added, allowing thorough tweaking of window behavior. 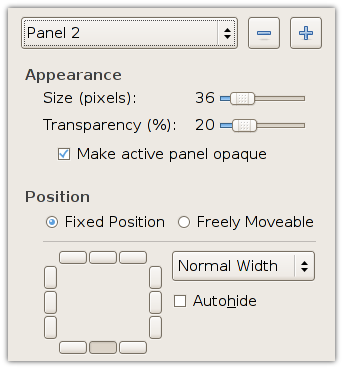 The Xfce4-panel was completely rewritten for the Xfce 4.4 release. Multiple panels are supported out of the box now and can easily be configured using the new Panel Manager shown in the screenshot below. One of the major problems in previous Xfce releases was that every plugin had to be run in the same process as the panel, and hence every plugin was able to crash the whole panel. To address this issue, support for external plugins was added to the panel. Developers of panel plugins can now decide whether the plugin should run as external process or as part of the panel process, depending on the stability of the plugin. 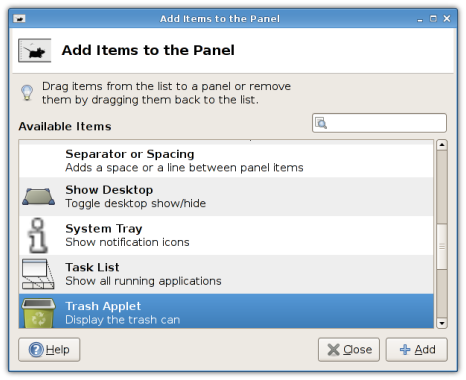 Since there is now support for multiple panels, the separate Xftaskbar4 and Xfce4-iconbox utilities are no longer required. Instead, both the taskbar and the iconbox are available as panel plugins now. Most of the additional panel plugins, available via the Xfce Goodies Project, have been updated for the new panel, and several new plugins were added. 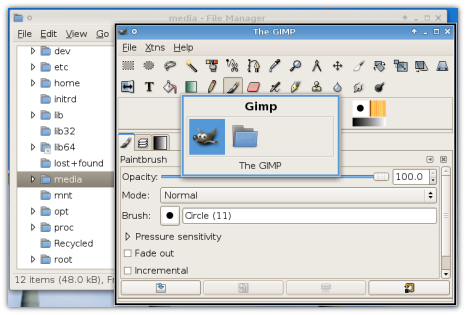 For example, the brand new xfce4-xfapplet-plugin allows users to add GNOME panel applets to the Xfce panel. 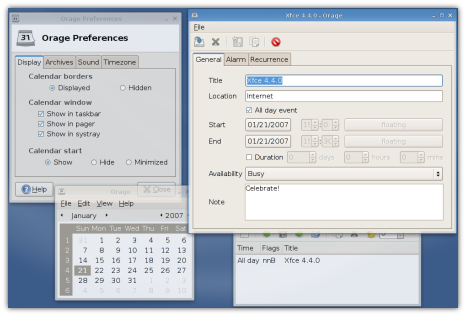 The new time management application Orage replaces the Xfcalendar, which was introduced with Xfce 4.2.0. Orage provides several features to efficiently manage your time. While Orage is very lightweight and easy to use, it supports all the important features found in larger calendar applications like Outlook or Evolution. While Xfcalendar used the custom dbh format in the past to store your settings, Orage is based on ical and therefore compatible with other calendar applications. While Terminal was already available during the 4.2 days, it was not mature enough at that time to be part of the core. With this major release, it was moved into the core desktop. Besides the basic features which you might expect from a terminal emulator, it includes some nice additional features, like multiple tabs per window, customizable toolbars and the ability to configure nearly every aspect of the application via hidden options. As can be seen in the screenshot above, this release also supports real transparency using Xfwm4's integrated composition manager. Xfprint, the Xfce printing management application, saw several small improvements with this release. First, the a2ps converter is not mandatory anymore, whilst still recommended. Support for CUPS 1.2 was added and Xfprint is now able to display the printer state with the CUPS-backend. Xfprint also integrates with MousePad to provide generic printing support for different kinds of text documents using the a2ps converter. 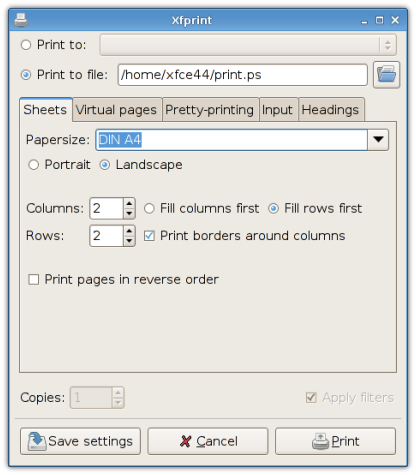 As you can see the print dialog still looks relatively similar to that of Xfce 4.2, but the internal workings of the printing support were improved, especially the CUPS support. Besides that, the printing management functionality was moved to a library, so other applications can use the API to access the printer configuration. The specification consists of two parts, the Autostart of Applications During Startup, which is implemented in xfce4-session and the Autostart Of Applications After Mount which is implemented in thunar-volman. 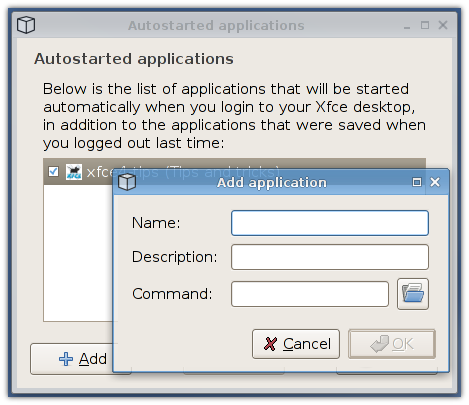 This release also includes the xfce4-autostart-editor, shown in the screenshot above, which allows users to easily add, remove or disable autostarted applications. This release introduces new options to customize the desktop to your needs. Some examples of new settings dialogs were already shown in the sections above. 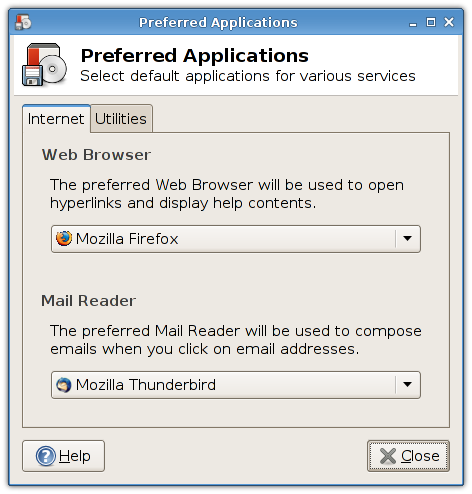 The preferred applications framework, which was previously only available in Terminal, was imported into Xfce, so users no longer need to edit shell profiles to specify which browser and terminal emulator should be used by Xfce applications. The goal was to make it as easy as possible to change an application for a certain category (GNOME users may have already noticed that GNOME adopted this approach, because it is such simple). 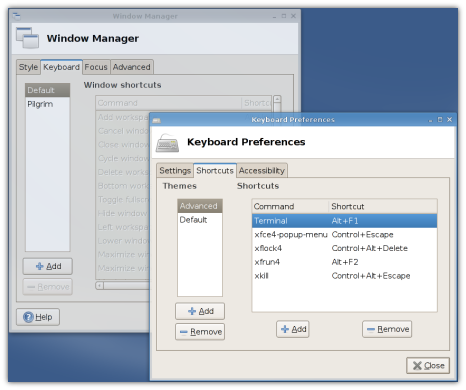 And then there was the problem with the keyboard shortcuts in Xfce 4.2... Xfce 4.2 limited the number of freely available keyboard shortcuts, while people wanted to assign any number of keyboard shortcuts. With Xfce 4.4 this limitation is history and the application shortcuts are now separated from the window manager shortcuts. Please post comments on this article in my blog and use the xfce mailinglist if you have questions about Xfce 4.4.0 or trouble with the installation.